A study by MIT in Massachusetts has found that combustion exhausts across the UK cause nearly 5,000 premature deaths each year. They also estimate that exhaust gases from aeroplanes cause a further 1,800 deaths annually, compared to 1,850 deaths due to road accidents. In total, about 19,000 deaths per year in the UK are caused by air pollution of all sorts – of which 7,000 are due to pollutants blown in from the continent. The findings challenge the traditional view that industrial plants are the main source of pollution, because traffic pollution occurs much nearer to people’s homes than industrial emissions. One of the authors, Steven Barrett hopes soon to conclude a detailed assessment of the health impacts of either a 3rd runway at Heathrow or a Thames Estuary Airport. The pair also estimate that exhaust gases from aeroplanes cause a further 2,000 deaths annually. (Should say 1,800 from aviation and shipping. See below). Overall, the study’s findings are in line with an earlier report by the government’s Committee on the Medical Effects of Air Pollutants (COMEAP), which found that air pollution in 2008 was responsible for about 29,000 deaths in the UK. The latest study adds to the debate by breaking down mortality rates according to sector – transport, energy and industry. “Cars and lorries emit right by where people live and work and so have a greater impact,” explains lead author Steven Barrett. “We are all in this together,” agrees Fintan Hurley of COMEAP. “The EU-attributable particulates in London are likely to have significantly contributed to the violations, because they raised the background concentration on which local short-term peaks were superimposed,” explains Steven Barrett. Practical measures include the reduction of black carbon emitted in car exhausts – especially from older cars that fail to burn their fuel completely. The report apparently states 1,800 deaths from shipping and aviation. In a study appearing this month in the journal Environmental Science and Technology, MIT researchers report that emissions from cars, trucks, planes and powerplants cause 13,000 premature deaths in the United Kingdom each year. 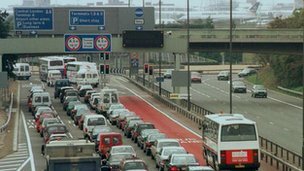 The increasing number of vehicles using the road to get to Heathrow airport is worsening air pollution in the area, a London Assembly report has said. The Plane Speaking report said 66% of 69 million passengers getting to the west London airport used cars or taxis. It said with bigger planes and the redevelopment of Heathrow, the number of passengers could rise to 95 million. The report suggests extending the London Underground’s operating hours to Heathrow to cut pollution. It also recommends introducing incentives to encourage people to use buses and coaches; encouraging airline operators to remove the most polluting aircraft from their fleets; and considering more robust measures to reduce the level of drop-off and pick-up traffic. The government has admitted breaching European Union pollution legislation, during a High Court battle with environmental campaign group. Lawyers for Environment Secretary Caroline Spelman made the admission following action by ClientEarth. But Judge Mr Justice Mitting said any enforcement action was a matter for the European Commission. He refused to make any declaration, or to order Mrs Spelman to outline plans for cutting pollution levels. ClientEarth had complained that Mrs Spelman had failed to consult on proposals which demonstrated how the UK aimed to comply with EU limits on levels of nitrogen dioxide. It asked the judge to declare that plans set out by the Department for Environment, Food and Rural Affairs (Defra) did not comply with EU law, and order Mrs Spelman to publish revised proposals. Government lawyers challenged the claim and said no High Court order was needed. Mr Justice Mitting said a lawyer had conceded that “the government is in breach of obligations” but said he would not make any “mandatory order”. He said the government could admit the breach and “leave it to the (European) Commission to take whatever action is right in enforcement”. “Such a mandatory order… would raise serious political and economic questions which are simply not for a judge,” he added. Mr Justice Mitting pronounced the action a “draw” and said costs should be shared. A spokesperson for Defra said it was happy that “the judge has ruled on our favour”. “A significant part of the UK meets EU air quality limits for all pollutants and air quality has improved considerably in recent decades. “Our air quality plans set out all the important work being done at national, regional and local level to meet all EU limits in the shortest possible time,” the spokesperson said. Stephen Hockman QC, for ClientEarth, told the court the charity had achieved something and said: “The government is in breach of its obligations under European law in relation to air quality. A spokesman said the legal challenge had been brought because air quality plans for 17 regions and cities would not comply with legal limits for air quality until after 2015, when the deadline for achieving the limits was 1 January 2010. He said he had wanted the court to order Mrs Spelman to draw up plans that would achieve legal compliance throughout the UK by 2015, and also to make a declaration that she was in breach of her legal obligations. Some of the air pollution around airports comes from unburnt fuel while engines are running while aircraft are on the ground. This ground running is the main culprit, with tank venting being only a minor part of the problem. ATK (aviation turbine kerosene) fumes permeate all airports much of the time and they can’t be refuelling for these durations. With prevailing wind conditions, kerosene fumes are plainly detectable 2.5 miles away from the eastern end ofEast Midlandsairport’s runway in a small village. It is unclear what epidemiological evidence there is, regarding respiratory and heart conditions in settlements close to airports. The suspicion is that prescribed medicines for respiratory complaints in areas close to airports are above the norm. However, correlation does not always imply causation and many airports are also close to busy roads. Some kerosene vapour is vented during refuelling, and one airport campaign group has visited their airport’s refuelling operation early on a winter’s morning with the local Environmental Health Officer and the airport operator. Whilst bulk delivery was via pipelines, during each aircraft refuelling operation, vapour is displaced from the wing fuel tanks to atmosphere. By way of comparison, in a road vehicle station, petrol vapour is recovered both during bulk delivery and during dispensing to individual vehicles. It was estimated that 40 aircraft fuelling up in the early morning each took on an average of 6,000 litres of fuel. So the equivalent amount of fuel vapour expelled would be about 250,000 litres. Using a 150:1 vapour/liquid ratio (taken from the 1967 Petroleum Officer’s Handbook of 1967), that would equate to 1,667 litres of liquid fuel. Not a trivial amount. However, it was difficult to conclude that this amount of vapour didn’t disperse quickly to the atmosphere within the confines of the airport. Albeit on cold mornings with a temperature inversion some of this vapour could float downwind to neighbouring communities and this seemed to match reported instances of complaints of fuel smells very close to the airport. The question was asked why airlines did not consider recovering this expelled fuel from an economic standpoint – it is understood that this is done in some parts of theUSA. The issue of micro-particulate air pollution, as well as some aspects of nanotechnology development, are an epidemiological time-bomb. Although much is known about the effects that respirable ultra-fine particles have on human beings there is little being done on the legislative front. While PM10 measurements can be a proxy for determining the likely levels of smaller airborne particles much more research needs to be taken into account. That is, the effect of sub-micron particles approaching nanometric (billionth of a metre) dimensions. Research into the effects of PM 0.1 is finding that there are significant health effects. Airborne particles currently controlled by legislation are breathable. That is, they are trapped mainly by the upper respiratory tract and can thus be coughed or sneezed out of the body. While these larger particles are not blameless from adverse health effects it is the smaller particles that cause real harm in that unlike the larger ones, which remain as extracellular pollutants, these actually enter the body’s cells and as such are respirable. Being intracellular inclusions much damage can be caused by these sub-micron particles, particularly if they carry a dioxin or heavy metal load. Ultrafine particulate matter in the air we breathe reduces T-lymphocyte levels. T- lymphocytes, or ‘T-cells’, are vital defences against infections, both fungal and bacterial, as well as playing a role in killing cancer cells and augmenting the defence mechanism of ‘B- cells’. This is well-documented and the effects of microparticulates of mean diameter 2.5 microns and less are on this aspect of the immune system are by no means a well-kept secret. It may well be that a fifth or subsequent daughter-directive of the 1996 European Union Air Quality Framework Directive (96/62/EC) will legislate for the control of ultrafine emissions. Summary: ‘London has got to clean up its act if its wants remain the top business city’. Though the excellent transport links to the rest of the world make it Europe’s premier business city, London fares less well on other issues which influence businesses in deciding where to locate. 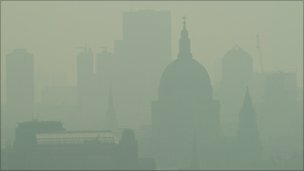 The annual survey by Cushman & Wakefield in 2011 “London is still ranked – by some distance from its closest competitors – as the leading city in which to do business.” However London performed badly in all the surveys on the quality of life it offered, scoring particularly poorly on air pollution and traffic congestion. HACAN says the message is clear. London has got to clean up its act if its wants remain the top city for business. Posted: Wednesday, April 18th, 2012. Filed in News about Airports.